As in every sport, goalies play an important role. These soccer goalie drills are designed to work on the fundamental movements to develop aspiring goalies. What is the best way to improve goalkeeping abilities? Repetition, repetition, repetition. The more touches goalkeepers get their hands on the ball, the more comfortable they will be. The more game situation shots and settings they are put in, the more natural their movements will be. Should my goalie(s) train on their own? Yes and no. Your goalie(s) should get time to develop their specific skills during training, but don't forget to involve your goalie in drills that also will improve foot skills and abilities as they will need to constantly work on those to be comfortable when on the ball in a game. For younger teams, when you don't necessarily have a specific goalie, coach goalie skills at some practices. 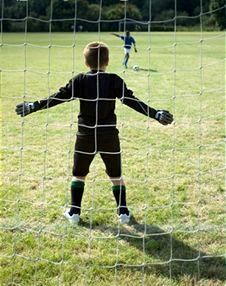 Most players are afraid or uncomfortable to go in goal when young, but most of their worries will be reduced if they are coached how to catch a ball, and what the role entails.